To connect to a database CNCnetPDM uses a Universal Data Link (.udl) file that contains information about your database. 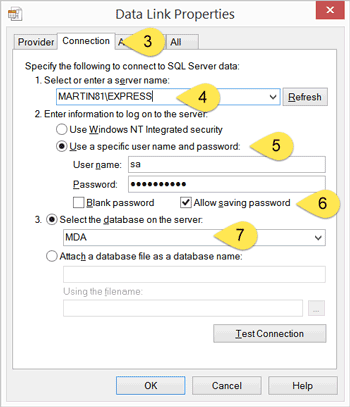 For Microsoft SQL Server please make sure that you have setup your database with 'SQL Server and Windows Authentication mode' enabled. Otherwise CNCnetPDM will not be able to connect to your database if you run it as background service with no user logged in. Double click on file connect.udl, click on tab ‘Provider’ (1), select the provider you want to use to connect to your database (2). Under ‘Enter information to log on to the server’ (5) select either ‘Use Windows NT Integrated security’ or ‘Use a specific user name and password’. If you plan to use CNCnetPDM as a background service it is highly recommended that you use the second option as the service normally is executed under the ‘local system’ account and should be able to run without any user logged on. In this case please also check ‘Allow saving password’ (6). Finally select the database on the server that contains the required tables (7), here MDA. Clicking on button ‘Test Connection’ should return ‘Test connection succeeded’. Click OK, you’re done. 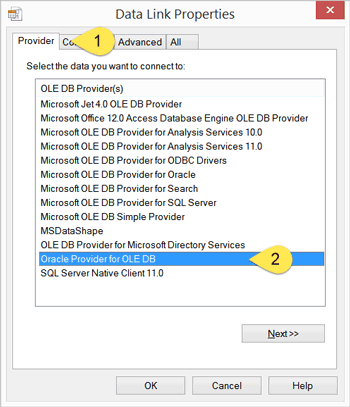 Oracle has 2 different types of database clients, one for 64 and one for 32 bit Operating Systems (OS). As CNCnetPDM is a 32 bit program please install the 32 bit version of the client tools even if you’re working with a 64 bit OS. To configure the database connection for CNCnetPDM on a PC with 64 bit OS proceed as follows, do NOT double click the .udl file. A dialog opens, click on tab ‘Provider’ (1), select the provider you’re going to use for your database connection (2). Under ‘Enter information to log on to the server’ (5) enter the username and password into the appropriate fields. If you plan to use CNCnetPDM as a background service it is highly recommended that you check ‘Allow saving password’ (6) as the service normally is executed under the ‘local system’ account and should be able to run without any user logged on. Click on tab ‘All’ and make sure that ‘Persist security Info’ is set to ‘True’. Clicking on button ‘Test Connection’ in tab ‘Connection’ should return ‘Test connection succeeded’. Click OK, you’re done. MySQL and MariaDB have 2 different types of database clients, one for 64 and one for 32 bit Operating Systems (OS). As CNCnetPDM is a 32 bit program please install the 32 bit version of the ODBC Connector even if you’re working with a 64 bit OS. To configure the database connection for CNCnetPDM on a PC with 64 bit OS proceed as follows, do NOT simply double click the .udl file. If not already done, Setup the required tables for machine data. 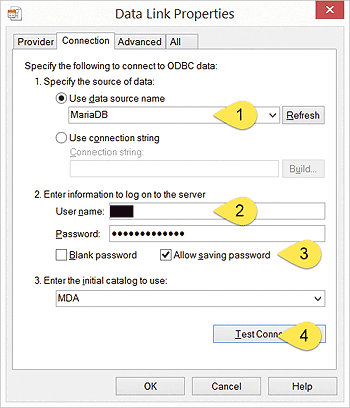 Next, download and install the 32Bit ODBC Connector for your database with default options, in this example the MariaDB ODBC Connector Version 3.0.3 was used (mariadb-connector-odbc-3.0.3-win32.msi). 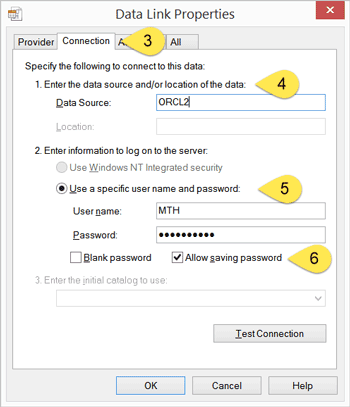 Select TCP/IP (1), enter the IP Address or DNS Hostname of your database PC (2), use Port 3306 (3). Enter the User name and password of a user with appropriate rights for the database (4). Navigate to the folder where CNCnetPDM is installed. Create a new text file, name it mariadb.udl, accept the warning. 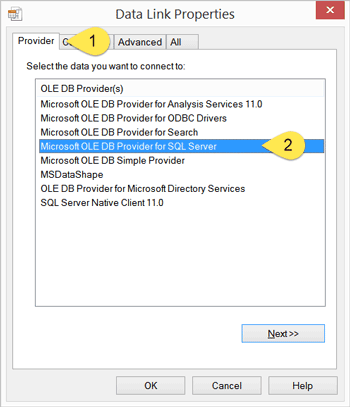 Click on tab provider, select 'Microsoft OLE DB Provider for ODBC Drivers', click [Next>>]. 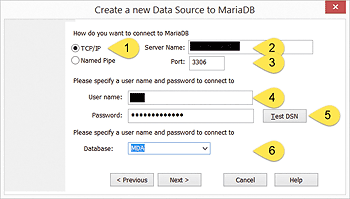 In tab Connection under 'Use data source name' select MariaDB (1). Under 'Enter information to log on to the server' enter the User name and password of the System DSN User (2). Check 'Allow saving password' (3). Select MDA as the initial catalog to use.